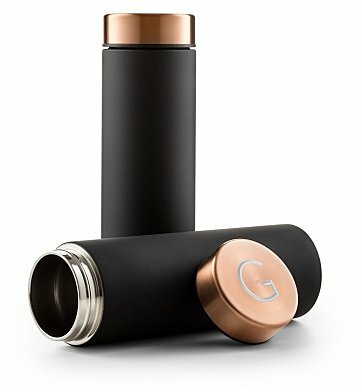 Ideal for professionals, travelers and anyone with an on-the-go lifestyle, this travel mug makes a great gift, especially with complimentary engraving of a chosen initial on the copper lid. Solid stainless steel construction with a dark matte finish and lustrous copper lid achieve a modern, contemporary look and feel. One Le Baton Copper Lidded Travel Tumbler. Complimentary Engraving on Copper Lid Surface. Your gift is securely wrapped to safeguard the shipping process and arrives presentation-ready in a GiftTree signature gift box. A free card with your personal message is included with your gift. Free Engraving! Select one initial to be engraved on copper lid surface. Enter information to be engraved using the personalization option during checkout. Gift Box Measures 5" x 10". Personalized Copper Lidded Tumbler is a hand delivered gift. These gifts are delivered by one of our local design centers located throughout the United States and Canada. Same day delivery is available for most gifts when ordered before the cutoff time. The cutoff time for Personalized Copper Lidded Tumbler is 2 PM in the recipient's time zone. Copper Lid Slender Travel MugThe matte-finish, copper-lidded Le Baton Travel Bottle keeps beverages cold for up to 24 hours, and hot for up to 8 hours. The slender design makes it the perfect travel companion, sliding effortlessly into laptop bags, carry-on luggage and backpacks. I've ordered a few of these as thank you gifts, but they're always sent directly to the recipient so I've never actually seen one in person. This time I ordered 4 and had them all sent to me to hand deliver to people. I opened them all up and I LOVE them! Really pretty, super solid, and the lid is real secure. The only thing I would wish for is a range of sizes because this one is a bit small. My daughter likes very much and impressed while receiving GiftTree Personalized Copper Lidded Tumbler on her Birthday. I recommend this Excellent item as a gift for any occasion.